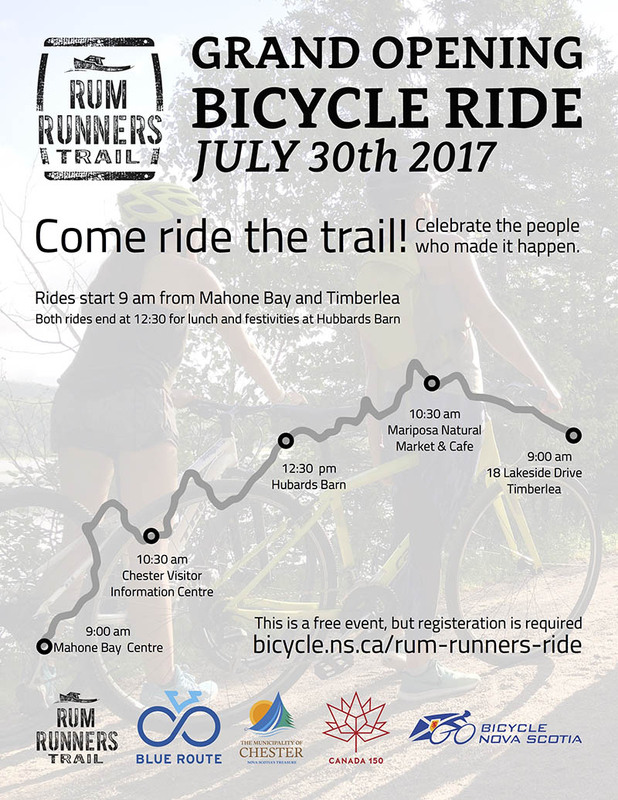 Bicycle Nova Scotia is proud to help launch the official opening of the Rum Runners trail, as well as its official designation as part of the Blue Route network, on July 30th. With the support of the Canada 150 celebration, BNS is helping to facilitate a ride of the trail, open for all ages and abilities. Come out and ride the trail! Celebrate its opening and support all the volunteers and people who have put in so much hard work to make it happen. This is a ride to celebrate the official opening of the Rum Runners trail, as well as its official designation as part of the Blue Route network. There will be a party with food and refreshments at the end of the ride where we can get together, talk about the ride, and meet some of the people and organizations that have been instrumental in making this trail happen. The ride will be leaving from two starting points (East/West), both starting at 9am and both ending up in Hubbards for 12:30pm. There will be a meet up at a halfway point where people can join the ride to make it shorter. The length of ride from either direction is approximately 45km (90km round trip). View the Map of the ride with meet up locations.